Seche Vite has ruined my nail game. How am I supposed to find a valid excuse to change my manicure on a regular basis when my nails are looking immaculate even after a week? I'm removing my polish through boredom now rather than necessity. Seche Vite makes a manicure last forever (well, at least a week) when usually my nails are chipped, scuffed, and tired looking after only a couple of days. 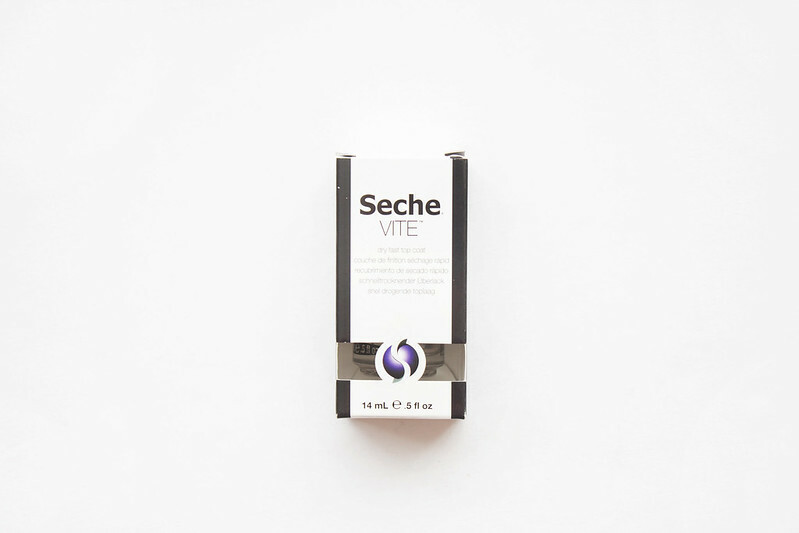 Seche Vite dries polish super fast - I mean ridiculously fast. I usually wait until the most inconvenient time to paint my nails (because I like to screw myself over) so it's nice not to have to worry about how I'm going to pull my tights up without smudging them. Instead I can go around touching everything seconds after painting them. The finished result leaves your manicure looking super shiny and vibrant plus I'm pretty sure it could survive an apocalypse. It doesn't tug, pull, or pick up residue from applied colours and it even smooths and corrects the texture of a poorly applied coat. There can be problems with the formula if it's not applied correctly. It needs to be applied to wet nails and you need enough to liberally cover the nail without layering it on too thick. If applied to dry nails or if you apply too much you’ll find the varnish will chip, flake, shrink or peel right off and a thick coat means you can literally pull the entire coat off your nail. I’ve experienced the latter and it’s pretty devastating. A friend told me Seche Vite would change my life and I kind of didn’t believe her but she was totally right.